In January 1823, the Gloucester Journal reported that the County Prison had installed a treadmill. Gloucester Prison, like many other similar institutions, had found it difficult to find suitable work for prisoners sentenced to do hard labour as part of their sentences. While women at Gloucester were put to work in the laundry, or mended prisoners’ clothes, finding labour for the men proved to be more of a problem. It had originally been intended that male prisoners in the penitentiary would work in solitary day cells, where they would do stocking-making or other manufacturing tasks. Not enough labour of this kind could be found, however, and when Thomas Cunningham, Gloucester Prison’s governor, gave evidence in 1819 to a Select Committee which was investigating labour and solitary confinement in prisons, he stated that the male prisoners in the penitentiary did “all the work of the prison”, such as whitewashing, sweeping, cleaning and gardening. Evidence given to this committee revealed that Gloucester Prison also had a treadmill (alternatively called a treadwheel), which was used to pump water into tanks, for the use of the prison. However, only two people at a time could work on this wheel, alternating with another pair of prisoners over a twenty-minute period, then going back to their cells, to be replaced by another labour group. With the continual growth in prisoner numbers over the years, this was hardly adequate to exercise and occupy all the male inmates. The new type of treadmill was the invention of engineer William Cubitt, who came from a family of millers. He wanted to find some arduous task to occupy the prisoners in his local gaol in Bury St Edmunds, Suffolk. The design he came up with resembled a common water-wheel, but with extra-long tread boards, which could be worked by about ten to twenty prisoners at a time. Cubitt was then asked to design a similar system for Brixton Prison, and once that had been installed, many other counties and towns decided that they wanted treadmills for their prisons too. Gloucester Prison began installing its new treadmill in December 1822, and it was first put to use on 8 January 1823. Reporters who were invited to inspect it described it as being in two divisions, with 36 men in total at work, whose weight on the wheel moved two stones which ground corn. In addition, the wheel set in motion machinery for bruising barley, and pumping water for the use of the prison. Whilst some were clinging by their hands working on the wheel, others were collected in the yard, walking in a weary round to escape catching cold, and to stretch their legs. Every now and then as the wheel revolved, a whitened step appeared, and then one of the workers would drop down, and one of the walkers would get up, and so the wheel and the punishment was kept moving. Not a word was spoken on the wheel, or off it, nor was it necessary; for each prisoner knew the moment that his spell ceased, so accurately, that he whose turn had come, had no opportunity of forgetting it. One could not fail to be struck by the air of languor, and almost misery, which always marks labour not lightened by reward. In November 1894, the treadmill at Gloucester Prison was in the news, when a prisoner dropped dead while working on it. Henry Johnson, aged 45, had been committed to the prison on 22 October, having been sentenced to 14 days imprisonment with hard labour for a theft. He was a strong, well-built man who seemed in good health and did not object to being assigned to the treadmill, but on Monday, 29 October he asked to speak to the doctor, complaining of compression in his chest and flatulence. The doctor found nothing wrong with the prisoner’s heart or lungs, and after being prescribed medicine for his indigestion, he was put back on the wheel. On Thursday afternoon, 1 November, Johnson had been on the treadmill for about five minutes when he suddenly fell backwards. He was pronounced dead at the scene, and an inquest found that he had died of syncope, which, it was said, could have happened at any time. 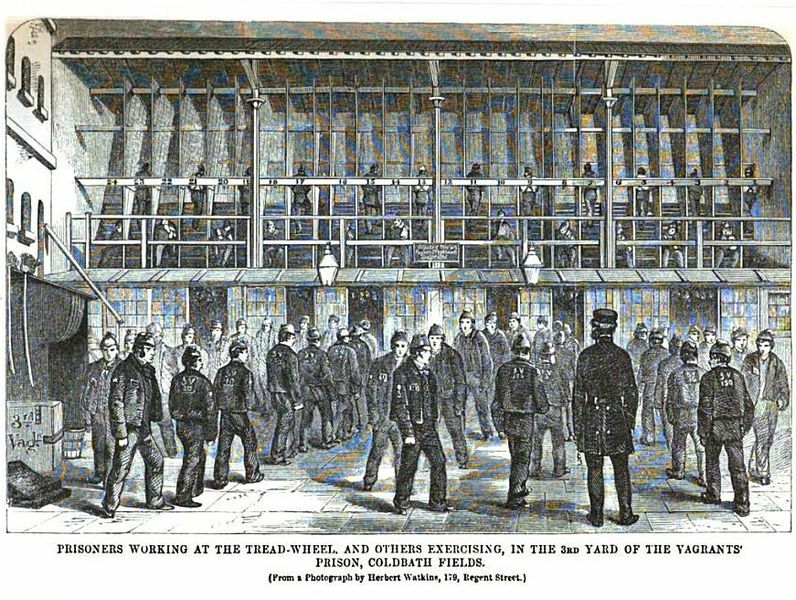 By the 1890s, the use of prison treadmills as a form of hard labour was falling out of favour. Although many institutions originally had used them to produce flour, advances in machinery and technology meant that man-power was no longer the most efficient way of producing goods, so treadmills were often used solely to exercise and punish prisoners. In addition, a number of accidents and cases of inappropriate use were reported in the press. The use of treadmills in prisons was abolished in 1902. At Gloucester Prison, the area where the treadmill had stood was filled by a new building, for the use of prisoners employed in “associated labour”. The Governor, in his Annual Report, published at the end of March 1903, stated that male prisoners had been found employment making mail bags for the General Post Office, sacks and hammocks for the Admiralty, wood-chopping for the War Department, and also worked in the service of the prison. The females, as usual, were doing the laundry for the prison, and mending prisoners’ clothes. ‘Report of the Select Committee on the State of the Gaols’, 1819, in British Parliamentary Papers, Crime and Punishment, Prisons, 1 (1819), pp. 388-405 (copy at Gloucestershire Archives, PS20). There is an interesting article on the introduction of the treadmill at Brixton Prison on Christopher Impey’s site, London’s Oldest Prison: ‘Engine of Terror: How Brixton Made the Treadmill Famous’. I happened upon your site whilst trying to track down a song I heard performed by Ron Taylor and Jeff Gillett several years ago about the Gloucester Gaol treadmill. I wonder if anyone knows (of) it and could point me in the direction of words and tune? The chorus ends with “and we wear the county colours of the yellow and the blue”. I think it’s a contemporary take on the historic facts – it certainly ties in very closely with the details herein. Thanks in anticipation, and thanks also for a most informative piece of scholarship. Hello! The song is called “The County Livery”, and it is about doing time in Horsley House of Correction, which was built at the same time as Gloucester County Prison and had the same regime. It was published by Thomas Willey in Cheltenham. It is in Roy Palmer’s book, “The Folklore of Gloucestershire”, in chapter 9, “Going For A Song”. In my edition, published by Westcountry Books in 1994, the lyrics are written out in full on page 240. I hope that helps. Wonderful! Thank you very much indeed – now I remember…! I have also had a most helpful response from the organisers of the Cheltenham Folk Club who are putting me in touch with Ron Taylor, from whom I first heard the song. I’m very grateful for everyone’s time and kindness. I shall be in Upper Soudley next month for a Morris dancing weekend, and I shall quiz some of my local acquaintances about the song while I’m there. Looking forward again to the delights of the county. We pay gym membership for that kind of misery these days! I know! Also people buy them for their home gyms. Not quite on the scale of those in prisons, though. If I were a female inmate I’d take umbrage at having to mend the male prisoner’s clothes!! Better than being on the treadmill!